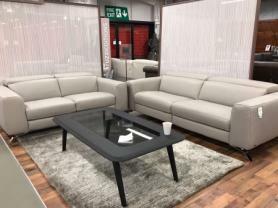 Absolutely stunning Natuzzi leather 3 seat, 2 seater and power recliner chair. The leather is high category from the Natuzzi range , protecta child and pet friendly. slim and modern design which will enhance the look of any room. Power recliner chair which completes the set so that you can put your feet up to relax at the end of day. Approximate Measurements: 3 Seater: 196 cm. 2 Seater: 140 cm. Chair: 87 cm. Depth: 93 cm.